Ready to start the next chapter of their lives together, Michael proposed to Liz by recreating their very first date. He took her to different spots that meant something to them, and stopped to pop the question on a romantic bridge that Liz loved. They met at a fall retreat four years earlier, and after two years of friendship, followed by 2 years of dating, she was ready to spend the rest of her life with him. When Liz and Michael began planning their wedding, she enlisted the help of Pinterest to inspire items and ideas she could put her own spin on. Putting a rustic touch on her travel inspired theme, she got right to work. The couple chose to have their ceremony at a nature preserve, and although her wedding planning was very budget-focused, Liz used her craftiness to create beautiful items that not only showcased her talents, but the theme and direction of the wedding. With the help of her mom, she made two barn doors, hundreds of paper flowers, a world map name chart, and her very own wedding cake. 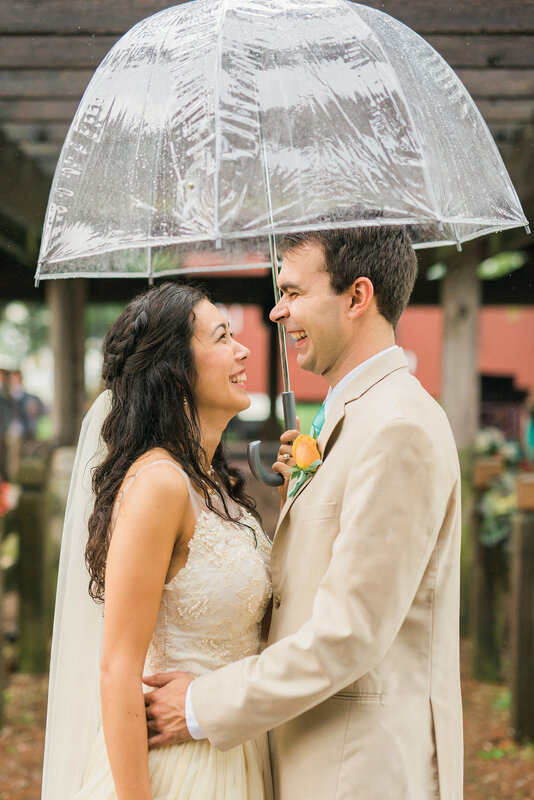 The rain that ensued all day, right up until the ceremony, was Liz and Michael’s most monumental moment of their wedding day. The downpour stopped a half hour before their ceremony began, creating a beautiful misty setting. They felt blessed to have all their family and friends stand by their sides on one of the best days of their life. With groomsmen and bridesmaids flying to and from Africa, Asia, and the Middle East, they were so honored to have everyone right here in the heartland for their big day.